2 How to brew tea of ​​the match? the match (Matti) - a wonderful Japanese green tea. Very interesting, that it is not usual for us twisted leaves, tea leaves, but a real tea powder bright green color. Make it, carefully having dried young tea leaves, and then, after removing coarse veins and stems, ground. The price of this tea is not cheap. to prepare 30 g powder of this elite require hours of manual labor. taste tart, saturated, sweetish. The higher the grade, the more expensive it cost. Exactly match tea since ancient times used in the traditional tea ceremony in Japan. 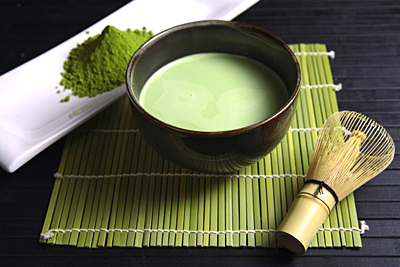 Tea has found application in food and cooking, and not only in Japan. It is added to candy, ice cream, cakes, cookies, pastries, mousses, sauces, liqueurs, cocktails, even latte. The benefits due to the fact, that the tea is not fermented, keeping all the substance unchanged. Characterized by a high content of whole complex antioxidants, polyphenols, proteins, vitamins (BUT, WITH, group B), minerals (gland, calcium, magnesium, copper, zinc, fluorine, nickel). there tannins, caffeine, amino acids. Tea accelerates metabolism, promoting weight loss, It cleans out toxins, It stimulates brain activity, stabilizes the nervous system, keeps you young and improves skin condition, It strengthens the heart and blood vessels, It prevents the formation of kidney stones, This powerful energy, boosts immunity. Beneficial effects on the organism grows significantly, because tea, dissolving in water, drunk with powder. How to brew tea of ​​the match? Incomplete teaspoon of tea you need to sift through a fine sieve, in order to avoid the formation of lumps. prepare a boiling water, bringing the heating water to the stage of "white keys" (93-95aboutWITH), then cool it to 80aboutWITH. Take a soft water, better than bottled. The sieved powder was poured into a small wide circle, water fill ostuzhennoy 70 ml (80aboutWITH) and whisk until foaming. The Japanese use for this purpose a special bamboo whisk, but in the absence of, you can use a fork or spoon. If traditionally in Japan match drink tea without any additives, neat, the Europeans and Americans often add it to a variety of cocktails, add to it the jam, rum, milk and other ingredients. Try some combinations, may they come to you to taste. Take 2-3 thin slices of ginger, put it in a mug, add 2 ch.l. blackcurrant jam, little cardamom, fill 150 ml of boiling water, Stir and wait for about 5 minutes, water has cooled down before 80aboutWITH, add 1 ch.l. the match, whisk well in foam. Tea is ready! banana clean, cut into pieces and put in a cup, add 1 no. 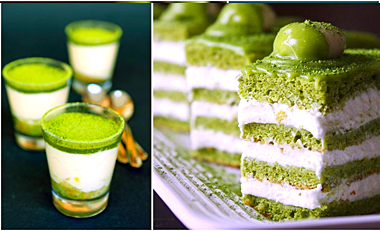 l. Matcha, 150 ml milk, whip until uniform, add ice and serve immediately. You can use strawberries, peaches.